Barricade tapes prevent accidents and mark areas for safety and a myriad of other applications. Ideal for windy outdoor weather exposure, our tapes are sold by their true stated mil thickness. We at Electro Tape chose not to confuse customers by using the term “nominal thickness”, which will typically mean for example that a 2mil product is actually only 1.5mils thick. When we say a product is 2mil, it is 2mil. A marking solution indoors and outdoors for off-limits areas, physical hazards, property lines, raising awareness of danger, cordon pedestrian traffic, accidents, crime scenes, construction sites, and more. 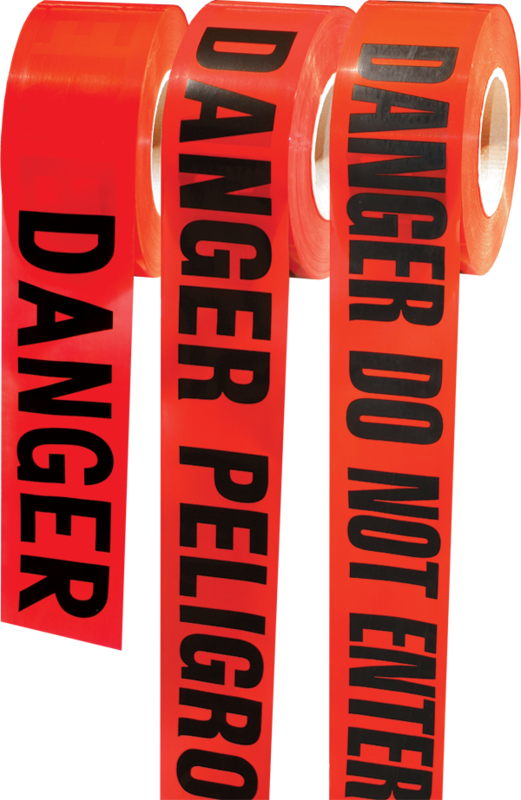 As a custom printed barricade tape provider, we can print whatever phrases fit your requirements, even your company logo which will advertise your company name throughout jobsites and facilities for as far as your sales will take it. Available in red and yellow, this non-adhesive polyethylene (PE) film barricading tape is strong, durable, and long lasting. The lengths of rolls we currently carry are 300-foot and 1,000-foot. 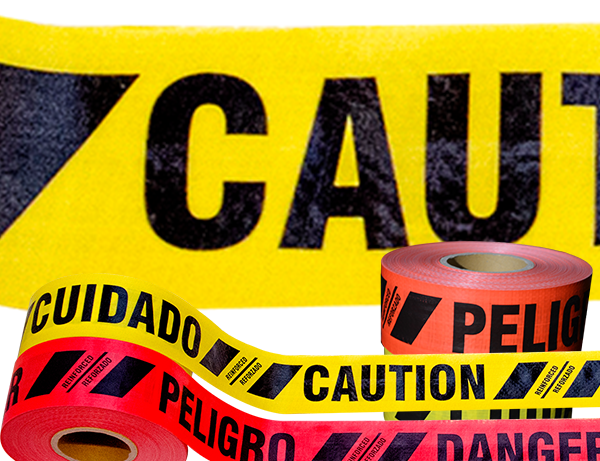 For your convenience, our most popular caution barricade tape comes in English or English-Spanish combination. Three sizes of thickness – 1.5mil, 2.0mil, 3.0mil – will designate hazardous areas above and below ground. Other Legends Available – The following are available on a special order basis. 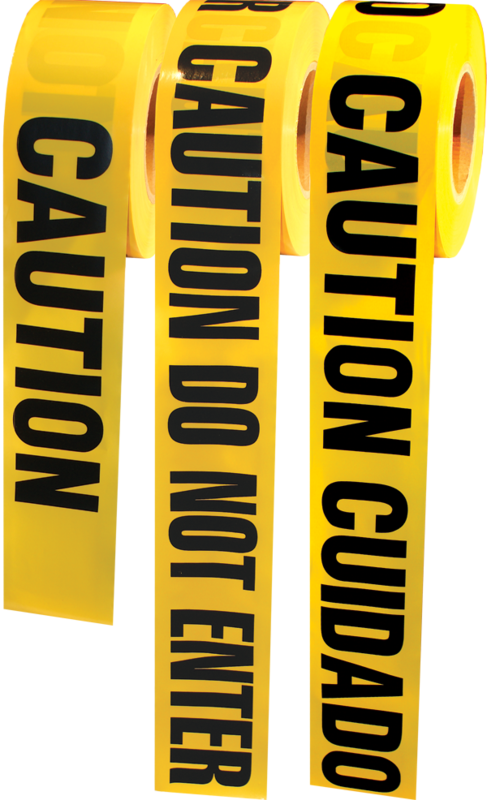 Our reinforced caution tape it is made of a thick (6 mil)- durable – woven reinforced polyethylene. It is typically used when along-term barricade solution is needed and regular caution tape won’t last. This product is perfect for the long term commercial job site or in harsh weather condition including high winds and snow. This heavy duty polypropylene (PP) barricading tape provides a tough barrier that contains UV stabilizers that enhance this product’s longevity in outdoor conditions. It is much more resistant to tearing than standard caution tape and has a tensile strength of 500 lbs. Available in yellow or red, both with a rigid black line down the center, standard rolls supply 150 feet of woven tape. Available in yellow, red, white, orange, blue, and green, PVC flagging tape is mostly used around construction for mapping, surveying, and roping off specific areas. Its non-adhesive surface leaves behind no reside and is easy to tie and tear. A brighter and more visually impactful than its non-glow cousin, this PVC flagging tape is available in yellow, red, orange, blue, pink, and lime. This high visibility product is commonly used to mark trees for logging, boundaries, navigation, or labeling. Additionally, this tape is sometimes used in triage for patients’ level of injury during a disaster situation.